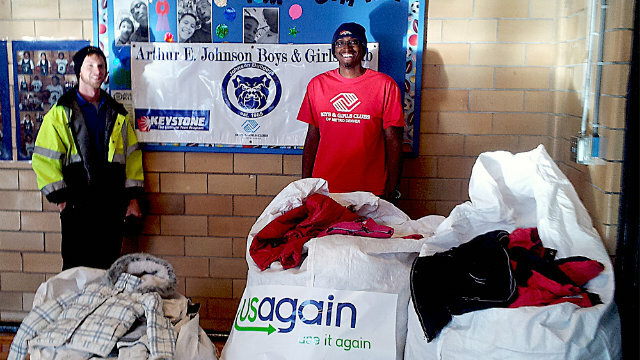 USAgain, the textile recycling company based in Denver, proudly donated over 150 winter coats to the Arthur E. Johnson Branch of the Boys & Girls Club on December 4, 2013. The company’s goal was to give back to a great local charity and help keep Denver children warm this winter. The donated coats were placed in USAgain bins throughout the month of November. This is the second year USAgain has donated to the Boys & Girls Club in Denver; we look forward to a great future of giving back to this great organization! Special thanks to all who stopped by our bins and donated winter coats – your effort goes a long way toward helping people and the environment. Give yourself a pat on the back – you deserve it!